The quality of cancer and palliative care is going through unprecedented change and development as a result of policy initiatives. The impact of these policies on education is unparalleled and it is essential that clinicians and educationalists are aware of the policy formation processes and educational strategies that meet the demands of these changing times. This book takes a holistic approach to patient care and draws on the diverse experience in hospices and highlights best practice to present a comprehensive and practical guide. However, it does more. New topics are given an educational perspective; those with limited educational experience are given sound advice; the implication of policy change is outlined. 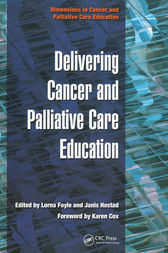 This is an important book and one which should be read by all clinicians, educators and managers responsible for improving services in cancer and palliative care.